Miguel Salazar is a writer based in New York City and a 2018 ICFJ International Reporting Fellow. Follow him on Twitter: @miguelxsalazar. 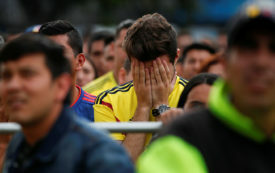 In Colombia, cases of intimate-partner violence against women rose by 33 percent during the past two World Cups. 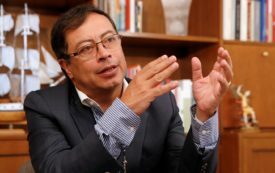 But Gustavo Petro’s presidential candidacy was the most successful leftist campaign in modern Colombian history, after decades of isolation and political assassinations. En entrevista con The Nation, el ex-alcalde de Bogotá habla sobre lo que significaría su elección para Colombia y la región. 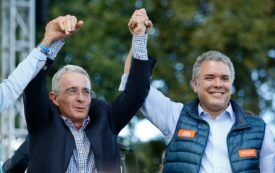 In an interview with The Nation, the former mayor of Bogotá discusses what his election would mean for Colombia and the region. El rapero puertorriqueño habla con The Nation sobre el colonialismo, Bernie Sanders, y el camino a la recuperación despues que el huracán Maria. The Puerto Rican rapper talks to The Nation about colonialism, Bernie Sanders, and the path to recovery after Hurricane Maria. 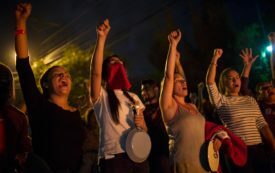 It’s increasingly clear that a majority of voters have had enough of US-backed President Juan Orlando Hernández. 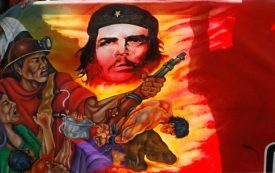 Fifty years after Che Guevara’s death, The Nation interviews his biographer, Jon Lee Anderson. 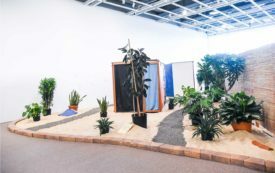 The Brazilian artist’s manipulations of color and space became a way for him to challenge society’s inequalities. 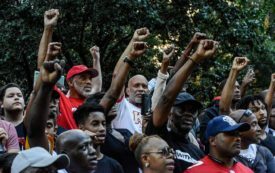 At a massive rally for Colin Kaepernick outside NFL headquarters, speakers called out the league’s hypocrisy.